The snark's getting turned up in Dota 2. The narrator of The Stanley Parable will be featured in an announcer pack for Valve's Dota 2. Announced on Twitter last week, The Stanley Parable writer Davey Wreden said, "Sitting down with [co-creator William Pugh] to begin writing The Stanley Parable Dota 2 announcer pack." 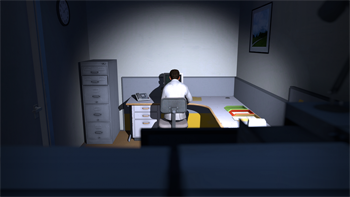 Kevan Brighting plays the narrator, giving the character a vital role in the story and gameplay of first-person exploration game The Stanley Parable. He often harasses Stanley, controlled by the player, through amusing lines and snarky wit. He joins several other announcers outside of the Dota 2 universe, such as Bastion's narrator Rucks, Half-Life 2's Dr. Kleiner, Trine's narrator, and Portal's GLaDOS. The packs are available for purchase through the Dota 2 store. The announcer packs replace the default announcer and mega-kills announcer. Other announcer packs of Dota 2 characters are also available for purchase. Most announcer packs are $7.99 to $9.99 with Trine's announcer pack on sale for $7.99 from $9.99 for a short time. Dota 2 is free to play through Steam. DLC like the announcer packs star characters in other games and place them in a different environment, which can often result in hilarity, as we will likely see from Kevan Brighting's portrayal of the snarky British narrator of The Stanley Parable. The Stanley Parable released in October on Steam. A demo is available for free, and while it doesn't actually feature any levels from the actual game, it conveys the feel of The Stanley Parable well without giving away the spoilers of the game.